La Jolla, Calif., October 10, 2016 (embargoed until 12:00 P.M. EST) — Most cases of liver cancer develop after long-term viral infection, chronic exposure to alcohol, or excessive accumulation of fat in the liver due to obesity. 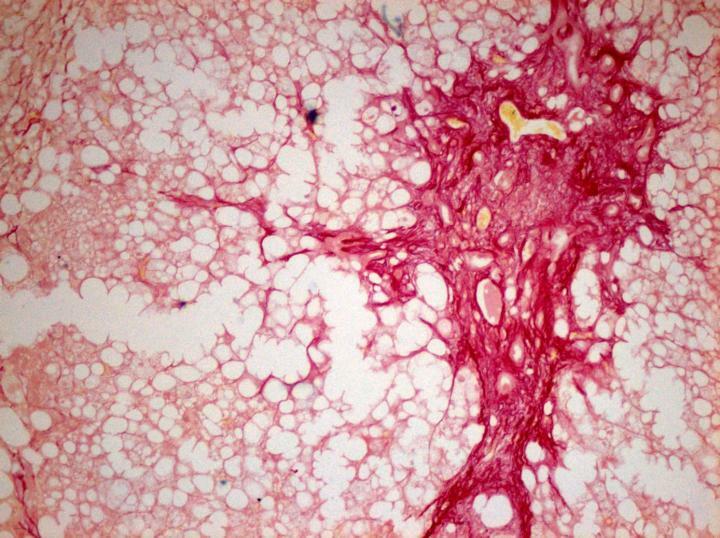 The liver reacts to those insults by trying to wall it off with scar tissue and calling in immune cells with inflammatory signals. If cancer arises, the resulting inflammation then stokes tumor progression. Scientists at the Sanford Burnham Prebys Medical Discovery Institute (SBP) have discovered that a key signaling protein helps suppress inflammation and scarring. The results, published today in Cancer Cell, represent another foundational step towards better treatments for liver cancer. In 2016 there will be about 39,000 new cases of liver cancer, of which only 20% of patients will survive more than five years after diagnosis. Further, liver cancer is one of the few types for which mortality rates are actually increasing in the U.S.
"Our findings are very important because they help predict which patients will respond to vitamin D analogs," said Jorge Moscat, Ph.D., deputy director and professor in the NCI-designated Cancer Center and co-senior author of the paper. "We show that those drugs' ability to suppress liver damage requires p62, which in liver tumors is usually absent from the cells that initiate the inflammatory cascade." Moscat and Maria Diaz-Meco, Ph.D., also a professor in the Cancer Center and co-senior author, have long been interested in p62, a molecular communication hub in the cell. Their previous studies have shown that high levels of p62 promote cancer. However, a recent investigation in prostate cancer found that in the tumor's surroundings, p62 dampens production of inflammatory signals that fuel cancer growth. The new study looked at whether p62 has these opposing functions in other types of cancer as well. Because they'd previously studied p62 in liver cancer, they removed it from the cells that become its support system–hepatic stellate cells. These cells, which make up a small proportion of liver tissue, are tremendously important since they normally store vitamin A and support liver regeneration. Interestingly, in mice lacking p62 specifically in stellate cells, they saw more liver inflammation and fibrosis and, when they were given a chemical that causes liver cancer, more tumors. "Whether p62 is pro- or anti-cancer appears to depend on the cell type," explained Diaz-Meco. "In cancer cells, it's bad, but in surrounding cells that feed the tumor, it's good." Importantly, the team's analysis of patient samples revealed that hepatic stellate cells from patients with liver cancer produce less p62 than normal liver tissue, confirming the relevance of their results to humans. The researchers wanted to know which of its opposing roles was most important, so they turned off the gene for p62 throughout the body in another set of mice. These mice also had more liver tumors than mice with p62, showing that hepatic stellate cells play a key part in promoting cancer. This study also revealed that p62 interacts with the vitamin D receptor, which returns stellate cells to their vitamin A-storing state. When p62 is missing, the receptor can't do its job, so the cells continue to produce pro-inflammatory signals. "Vitamin D and its analogs may still help prevent cancer in patients with hepatitis or fatty liver disease," commented Diaz-Meco. "At that stage, enough p62 may still be present in stellate cells for the vitamin D receptor to work." "Since p62 is so important in preventing liver cancer, we're now interested in why it disappears in stellate cells," said Moscat. "We plan to explore that question, which may lead to ways to turn its expression back on, which should block liver cancer progression." This research was performed in collaboration with scientists at the Mayo Clinic College of Medicine and the Moores Cancer Center, UC San Diego School of Medicine. Funding was provided by the National Institutes of Health and the Superfund Basic Research Program.